The local TAPS chapter investigates the accuracy of the latest geoid model. 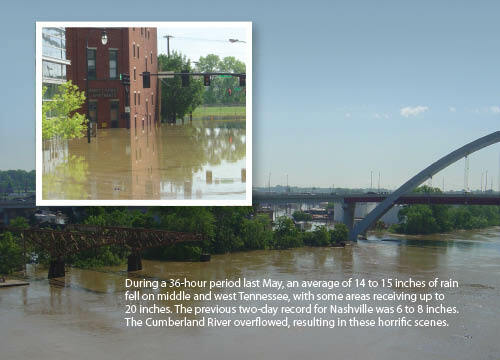 weather report calling for weekend rains totaling more than six inches in a 24-hour period was just the start of trouble for those of us living in middle Tennessee at the end of April 2010. We cancelled plans to celebrate my wife’s birthday, and all we could do was stare at the TV as authorities warned everyone to stay home. Reservoirs were flooded to capacity, portions of the interstates turned into rivers, and thousands of residents were displaced from their homes. As I watched, I thought of the elevation certificates I had prepared since being licensed. Was I right in every watershed? How many phone calls would I receive from flooded customers, and how many potential professional liability claims would be made? As a news-worthy event, our flood may have been overshadowed by the oil spill in the Gulf of Mexico, but it was nonetheless an historic event not to be forgotten, one that statistically has only a 0.1% chance of happening again in any given year (see sidebar, below right). The flood opened the eyes of many professionals—civil engineers and surveyors alike—who practice in the area. A few weeks after the flood, my company started receiving calls. Surprisingly, they weren’t from previous customers asking why their property had flooded but from those asking for my assistance on new elevation certificates to start the rebuilding process. I also received calls from peers who knew my GPS experience, wanting me to check their work. Regardless, after seeing the devastation first hand, I prepared some of my work at cost for as long as three months after the flood. For 36 hours last May, the skies over middle and west Tennessee opened and dumped 14 to 20 inches of rain. Before it was over, 24 people were dead, 11 of them in Nashville, and 49 counties were declared eligible for disaster assistance. High waters shut down major highways, including a stretch of Interstate 24 in Nashville, and motorists had to be rescued by motorboat, according to reports in The Nashville Tennessean. Hospitals moved their patients to higher floors or totally evacuated their buildings, and the Gaylord Opryland Resort and Convention Center relocated its 1,500 guests. Roughly 10,000 people were forced out of their homes and 3,800 businesses were temporarily or permanently closed from the high waters. We also heard the story of a man who drove through police barricades to get across town to his mother, finding her neck-deep in water, and the story of the baby born in a living room in the midst of all the other chaos. Volunteers were abundant, according to reports, with Hands On Nashville organizing 25,000 volunteers who logged about 330,000 hours. A high dollar amount has been placed on the two days of torrential rain. According to a recent story in The Tennessean, federal aid is expected to come in at $612.5 million to rebuild roads and other infrastructure, as well as for the overtime paid to government workers. A price tag of $100 million was put on buying damaged properties in flood-prone areas. In the private sector, it was estimated that $3.6 billion in annual revenue was lost. 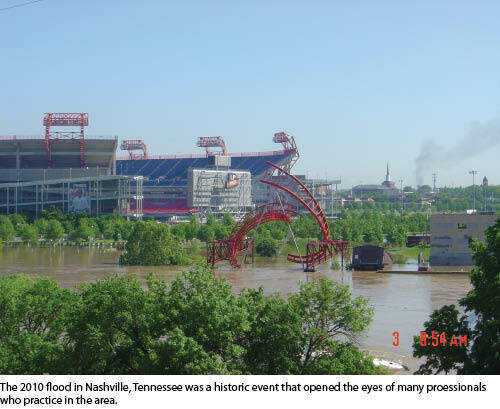 The Army Corps of Engineers has called the May 2010 event a “1,000-year flood,” meaning that there was a 0.1% chance of it occurring—small odds indeed for all that water, estimated at 420 billion gallons in the areas of heaviest rainfall. When I looked at the report I noticed that the OPUS solutions were using the new GEOID09 by default, which was recently adopted and supersedes the previous GEOID03. I then resubmitted the data to OPUS and, through the settings, chose GEOID03. Those returned solutions matched the data collected through my reference network. Immediately, I knew something wasn’t right, because my RTK network field data (which used GEOID03) was measuring on-the-fly orthometric heights of the NGS monument, which we tied to within 0.02 feet of the published NAVD88 elevation. I notified a few of my peers about my immediate concerns and decided to wait to bring the issue up again at my local chapter meeting with the Tennessee Association of Professional Surveyors (TAPS); however, I decided to continue to use GEOID03 in my practice. Because my practice area is not isolated, I started to plot the differences between GEOID03 and GEOID09 over a wide area in middle Tennessee. At the local area chapter meeting that July, I brought up the issue. Other surveyors had also noticed the difference, and the discussion of why we were seeing it was inconclusive. The next meeting was for an election, and I don’t know about your chapters but our election nights typically have low turnouts. Nevertheless, I wanted to attend so we could continue to discuss the geoid. To my surprise, I was elected president for my local chapter and also named chair to a committee that would investigate the geoid issue. (After I left that meeting I was thinking that maybe I should have stayed home). When I started researching the new geoid, I learned that all information regarding the work by NGS is published and available to download through their website. However, what I studied didn’t point me anywhere conclusive, so I decided to break everything into its simplest parts. Question 1: My GPS receiver provides what information? Answer: Latitude, longitude, and ellipsoid height. Everything else is only a conversion by the software we use. by NGS provide what information? Answer: The numeric models provide the separation distance between the ellipsoid height and the orthometric height (the leveled and fixed elevation referenced to the NAVD88 datum) based on its geographical position. Question 3: Is it possible to plot the difference between the published GEOID03 and GEOID09? With those answers I decided to model Davidson County, Tennessee. I started with a one-mile grid that covered the county. For each grid point, I computed the geoid separation (the difference between the ellipsoid height and orthometric height for that point) for the 2009 geoid model. Using Leica Geo Office, I then did the same thing for the 2003 geoid model. I took the difference between the two geoid separations and used it for the elevation value and contoured the points (Figure 1). I was surprised at the distribution. The contours agreed with differences I had noticed earlier, and a pattern was forming. I downloaded the points used to create GEOID09 along with their datasheets and saw that the largest difference was with one specific point, PID FD1646. It modeled and looked like a bad rod height. I sent all of my data and exhibits to the co-chairs of the committee and asked for an opinion. The data and everyone’s comments managed to find their way to the Tennessee Department of Transportation (TDOT), where they acknowledged our concerns and opened a few doors by providing us with contacts at NGS. 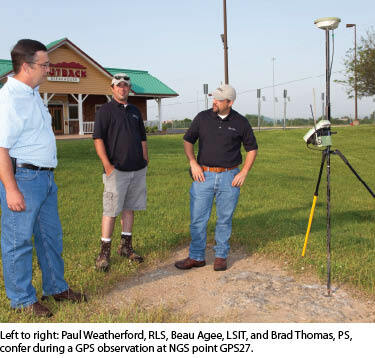 TDOT indicated that they were working with NGS concerning ellipsoidal heights at PID FD1646 and several other select static points across the state. 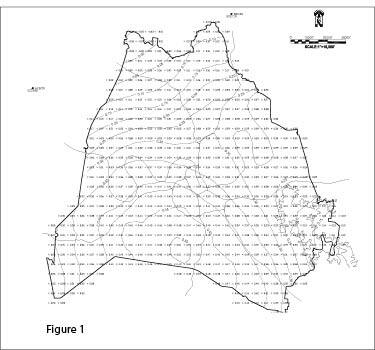 With that information, I prepared another model for the entire state using a ten-mile grid instead of a one-mile grid (Figure 2). The results were similar to the first model and provided a graphical confirmation of the additional points that TDOT was concerned about. I started communication with NGS through email. Their responses were detailed and appreciated but still didn’t explain the actual cause of the problem. For every answer I received, I asked more questions. I decided it was time to measure the points in the field myself and concentrated on PID FD1646. Again, using GEOID03, I discovered that the measurements were closer to the published orthometric height than when I used the new GEOID09. To my surprise, the ellipsoid height I was measuring on the point matched the superseded ellipsoid height (December 14, 1995) and was not based on the 2004 and 2007 adjustments. The difference was 0.115 meters (0.38 feet). This was both with OPUS-RS and my subscribed reference network. Immediately I thought there was an ellipsoid-height error in the compilation of GEOID09, based on the 2004 and 2007 adjustment. This matched with TDOT’s concerns. Now, based on this evidence, the problem seemed to be not with GEOID09 but with the adjusted ellipsoid heights. GEOID09 was based on published orthometric heights and adjusted ellipsoid heights in the database and not true, measured ellipsoid heights; therefore, my model showing the differences between the geoid separations from GEOID09 and GEOID03 was modeling the change in adjusted ellipsoid heights. To help confirm the results, I asked for help from Brad Thomas, the current president of TAPS middle chapter and a surveyor with Barge Waggoner Sumner and Cannon, Inc. Our results showed that the difference was less than a centimeter within the measurement of the ellipsoid height. Again I contacted NGS with the measurements. They responded that the official ellipsoidal height (NSRS2007) from the NRA 2007 may not be consistent with what we measure in the field using OPUS or CORS network stations. GEOID09 will be consistent with the database values (hence, NSRS2007), but we may not be able to get the same ellipsoidal height value as the database. GEOID03 will certainly be consistent with the pre-NRA 2007 ellipsoidal height values because the superseded values would have been those used to make the GEOID03 model. My questions concerning the 2004 and 2007 adjustments were redirected to another person at NGS. I heard back that a measured ellipsoid height is always better than an adjusted ellipsoid height, which confirmed that some (but not all) ellipsoid heights based on the 2004 or 2007 adjustment were suspect. Basically, they were telling me that here in middle Tennessee we have a few select points that may have been adjusted erroneously and that contributed to the error we were seeing. They went on to say that NGS stands behind OPUS and OPUS-RS solutions, just as I do. My only concern with OPUS/OPUS-RS is that GEOID09 is the default geoid model, and, with the ellipsoid height discrepancy in our area, a surveyor must specifically select GEOID03 as a processing option. Beyond that, OPUS-RS/OPUS is a valuable service, and the work that went into it is extraordinary. It helps us practitioners who use the service stay within a tenth of a foot from each other. With the advent of additional CORS stations, the solutions may be more precise than baseline processing. I won’t disagree with the fact that if good field procedures are followed, OPUS-RS or OPUS will provide a solution that can be replicated by RTK using CORS stations or other similar OPUS solutions now and into the future. The GPS stations used for OPUS run continuously, so you can see the movement of the continental plate: not something I worry about in middle Tennessee, but California is experiencing movement faster than middle Tennessee. The coordinate positions of the CORS stations that are published don’t change their values, so the plate movement can become a problematic issue for NGS to work through. In areas such as California, NGS is addressing this in real time. As I mentioned above, TDOT has been working with NGS to correct the problem here in middle Tennessee by measuring the suspect points in the database in order to officially change the published ellipsoid height. This will provide data to NGS for future adjustments and future geoid models; however, I don’t expect that GEOID09 will be revised as GEOID03 was in Louisiana after Katrina. The biggest problem with GEOID09 where I live is how it relates to the flood plain. Only 20% of my practice concerns the floodplain, but that is enough for me to raise my questions. I’m a not a scholar or a person with advanced degrees; I’m only a practitioner licensed to practice in several states, and my boots are probably like yours, with mud on them almost every day. Yet I recognize that, unfortunately, there are surveyors within my practice area (and vendors who sell equipment to them) who do not truly understand the theory or practical applications of GPS, resulting in a false coordinate system that could cause harm to the public. For instance, a surveyor who established an elevation based on GEOID09 along the Harpeth River in Davidson County—which was 0.5 feet higher than the true estimate of the orthometric height—will cause any reconstruction to be 0.5 feet lower than the established flood heights (this is an old-school analogy: raise the benchmark, lower the grade). In fact, I imagine this example has already happened because we have arrived at the one-year anniversary of the flood. 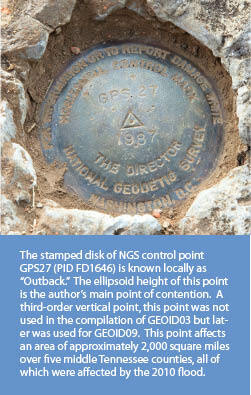 If you are in a state where the new GEOID09 is a better fit to known monuments than GEOID03, then use GEOID09. However, regardless of your location, if you check in to trusted monuments using GEOID03 and the data fit better than GEOID09, use GEOID03. Consider also that the local chapter of your state professional association may have more to contribute than just professional development hours or continuing education credits. Local chapters have a lot to offer. The reason I took time to write this article is to reach all those surveyors out there who are missing out on the benefits of membership. Paul G. Weatherford is a registered professional land surveyor with more than 20 years of experience encompassing a diverse spectrum of civil and land surveying projects. He has managed teams of professionals in land development, consulting engineering, and land-surveying specific projects. He served in the military as an engineering officer and has managed the development of preliminary plats, construction documents, and final plats for more than 4,000 single-family units during his career.